On the 24th (Fri), contemplate the waterfront views at Ooty Lake. To find more things to do, maps, and tourist information, refer to the Ooty (Udhagamandalam) planning website . New Delhi to Ooty (Udhagamandalam) is an approximately 6-hour combination of flight and taxi. You can also drive; or do a combination of bus and taxi. When traveling from New Delhi in May, plan for a bit cooler days in Ooty (Udhagamandalam), with highs around 40°C, while nights are about the same with lows around 28°C. Finish up your sightseeing early on the 25th (Sat) so you can go by car to Mysore District. Mysore District is an administrative district located in the southern part of the state of Karnataka, India. On the 26th (Sun), learn about wildlife with up-close encounters at Sri Chamarajendra Zoological Gardens, step into the grandiose world of Mysore Palace (Amba Vilas), and then look for gifts at Adil & Azam. To find traveler tips, reviews, where to stay, and other tourist information, go to the Mysore District journey maker website . You can drive from Ooty (Udhagamandalam) to Mysore District in 2 hours. Other options are to do a combination of bus and taxi; or do a combination of bus and taxi. Traveling from Ooty (Udhagamandalam) in May, you will find days in Mysore District are a bit cooler (34°C), and nights are about the same (25°C). Finish up your sightseeing early on the 26th (Sun) so you can go by car to Bengaluru. Start off your visit on the 27th (Mon): contemplate in the serene atmosphere at ISKCON Temple Bangalore, stroll around Cubbon Park, then get a taste of the local shopping with UB City, and finally admire the natural beauty at Lalbagh Botanical Garden. For ratings, other places to visit, reviews, and tourist information, go to the Bengaluru online holiday planner . Traveling by car from Mysore District to Bengaluru takes 3 hours. Alternatively, you can do a combination of taxi and bus; or take a train. Traveling from Mysore District in May, you will find days in Bengaluru are a bit warmer (39°C), and nights are about the same (26°C). Finish your sightseeing early on the 27th (Mon) to allow enough time to travel to Tirupati. Being a major pilgrimage spot at the foot of the Seshachalam hills, Tirupati tourism revolves around Hindu temples and vast nature reserves. 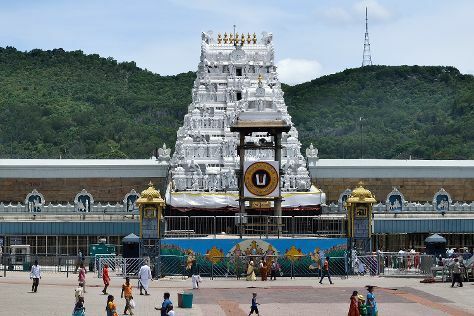 Start off your visit on the 28th (Tue): contemplate the waterfront views at Tumbhuru Teertham, contemplate the long history of Tirumala Temple, then explore the activities along Vaikuntha Teertham, and finally take in the spiritual surroundings of Sri Varahaswami Temple. Get ready for a full day of sightseeing on the next day: take in the spiritual surroundings of Sri Bedi Anjaneyaswami Temple, contemplate the waterfront views at Japali Teertham, then contemplate in the serene atmosphere at Sri Kalyana Venkateswaraswami Temple, then take in the spiritual surroundings of Sri Padmavathi Ammavari Temple, and finally contemplate in the serene atmosphere at Sri Govindarajaswami Temple. For reviews, maps, more things to do, and tourist information, read our Tirupati trip planner. You can do a combination of bus and flight from Bengaluru to Tirupati in 3.5 hours. Alternatively, you can drive; or take a bus. Finish your sightseeing early on the 29th (Wed) to allow enough time to travel back home.